Nov06 Comments Off on Are cat cafés taking over the world? Are cat cafés taking over the world? With the phenomenon of cat cafés expanding globally, it makes sense to ask these kinds of questions. Oakland has been blessed with having the first permanent cat café in the United States. This little shop in California opened its doors last week to the general public. Its first three weekends are reported to be fully booked. Cat cafés are a mix between a coffee shop and a cat adoption center. The idea first started in Taiwan with the original café, called Cat Flower Garden, but has now spread through the rest of Asia and into Europe. New York had a temporary cat café in April, which was the beta testing for American culture. Because you know, humans can’t seem to get enough of cats. CNN reported that there are about 150 cat cafés around the world. In Canada, there are cat cafés in Montreal, which was the first North American cat café, and Toronto. They seem to be very popular up there in the harsh winter. There is no news about permanent cat cafés anywhere on the East Coast, but the West Coast is building up steam to open more very soon in San Francisco, Portland, Los Angeles, Denver, San Diego and Seattle. Hopefully these more of these open up soon, because I’m sure the public is eagerly awaiting the things Americans seem to love almost as much as freedom: cats and coffee. Unlike everyone else out there, cats aren’t my favorite animal, or my favorite pet. Don’t hate me, it’s just my opinion. But I’d definitely go to a cat café if it were open anywhere near the Boston area. It’s a great advertising tactic, especially in a large college town where students barely see animals for nine months of the year. 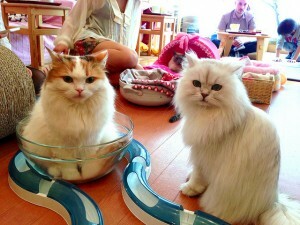 If you want to see how Japan works their cat cafés, check out this video from Time. Still not sold? Below is a video about cat cafés with an interview with KitTea’s co-founder, Courtney Hatt. Happy Friday!